Corsair is well known for its PC components spanning a range of categories -- from memory to cases, power supplies, cooling and more. 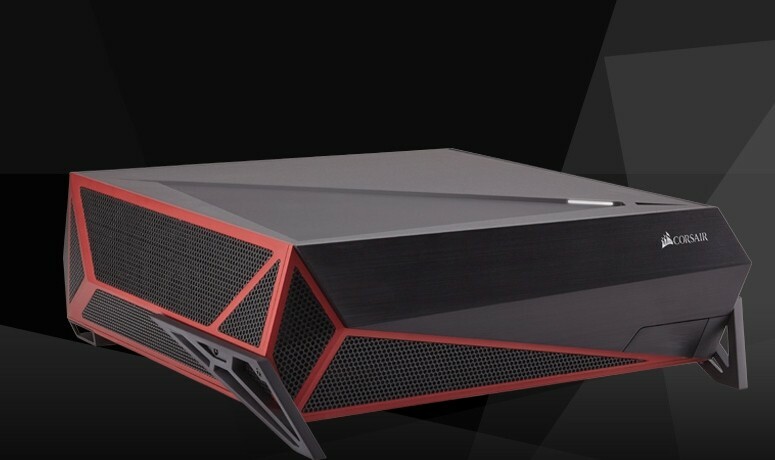 But this year it's trying something new with Bulldog, a barebones, console-like Mini-ITX box that’s designed for the living room and can handle high end hardware. Announced at this year’s Computex, the Bulldog kit includes the chassis, motherboard, a fully modular 600W power supply, and a Hydro series liquid CPU cooler to keep your build running quietly. You’ll need to throw in your own CPU, memory, storage, and graphics card (full length supported). The kit will go on sale sometime in Q4 for $399 and will support both AMD and Intel CPUs. Though not much is known about the AMD version at this point, for the Intel side Corsair has said it will use a next-gen motherboard to support the upcoming Skylake CPUs. This should also mean support for up to 32GB of DDR3 or DDR4 memory, USB 3.1, Gigabit Ethernet, built-in Wifi, and 7.1 audio. Inside there’s space for up to three 2.5" and 3.5" storage drives and you can also opt for a GPU cooler for an extra $100. Corsair is reportedly working with MSI on custom GeForce cards with integrated liquid cooling too. The demo unit being shown off was plugged into a 4K TV, while its combination of overclocked, liquid-cooled Intel Core i7-4790K CPU and Nvidia GeForce Titan X graphics card quietly handled games like Project CARS, Witcher 3, Grand Theft Auto V at around 30-60 frames per second.